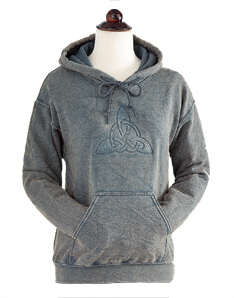 The trinity knot, signifying harmony and balance, brings warmth and comfort in this hooded sweatshirt. Embossed knot embellishes this pullover, stonewashed for weathered color; each will vary. Cotton/polyester; machine wash. Made in USA. Sizes S-XL, 2X, 3X. Please note: this item has a price change based on size. Please select your desired size to view the price. Very happy with these new hoodies. Already have the "World Tree" versions, and was excited to get this "Triskel" version as well!